For other uses, see Wolf in Sheep's Clothing (disambiguation). A wolf in sheep's clothing is an idiom of Biblical origin used to describe those playing a role contrary to their real character with whom contact is dangerous, particularly false teachers. Much later, the idiom has been applied by zoologists to varying kinds of predatory behaviour. A fable based on it has been falsely credited to Aesop and is now numbered 451 in the Perry Index. The confusion has arisen from the similarity of the theme with fables of Aesop concerning wolves that are mistakenly trusted by shepherds; the moral drawn from these is that one's basic nature eventually shows through the disguise. The phrase originates in a sermon by Jesus recorded in the Christian New Testament: Beware of false prophets, which come to you in sheep's clothing, but inwardly they are ravening wolves (Gospel of Matthew 7:15, King James Version) . The sermon then suggests that their true nature will be revealed by their actions (by their fruits shall ye know them, verse 16). In the centuries following, the phrase was used many times in the Latin writings of the Church Fathers and later on in European vernacular literature. A Latin proverb also emerged, Pelle sub agnina latitat mens saepe lupina (Under a sheep’s skin often hides a wolfish mind). 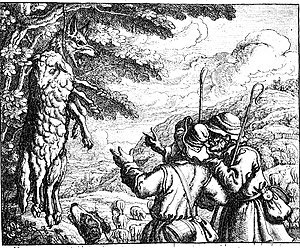 Although the story of a wolf disguised as a sheep has been counted as one of Aesop's Fables in modern times, there is no record of a fable with this precise theme before the Middle Ages, although there are earlier fables of Aesop in Greek sources to which the Gospel parable might allude. The first fable concerning a wolf that disguises itself in a sheep's skin is told by the 12th-century Greek rhetorician Nikephoros Basilakis in a work called Progymnasmata (rhetorical exercises). It is prefaced with the comment that 'You can get into trouble by wearing a disguise' and is followed by the illustrative story. 'A wolf once decided to change his nature by changing his appearance, and thus get plenty to eat. He put on a sheepskin and accompanied the flock to the pasture. The shepherd was fooled by the disguise. When night fell, the shepherd shut up the wolf in the fold with the rest of the sheep and as the fence was placed across the entrance, the sheepfold was securely closed off. But when the shepherd wanted a sheep for his supper, he took his knife and killed the wolf.' The conclusion drawn is different from the Gospel story. In the former one is warned to beware of hypocritical evil-doers; Nikephoros warns that evil-doing carries its penalty. Woodcut by Francis Barlow, 1687; the end of "The Wolf in Sheep's Clothing"
The next version does not appear until three centuries later in the Hecatomythium of the 15th-century Italian professor Laurentius Abstemius. In his telling, 'A wolf, dressed in a sheep's skin, blended himself in with the flock of sheep and every day killed one of the sheep. When the shepherd noticed this was happening, he hanged the wolf on a very tall tree. On other shepherds asking him why he had hanged a sheep, the shepherd answered: The skin is that of a sheep, but the activities were those of a wolf.' Abstemius' comment on the story follows the Biblical interpretation: 'people should be judged not by their outward demeanor but by their works, for many in sheep's clothing do the work of wolves'. Not by my own will but the shepherd's folly. For gratitude cannot change nature. The Greek fable is numbered 267 in the Perry Index. As in the case of The Walnut Tree, however, this would not have been the first time that Abstemius adapted one of Aesop's fables to fit a contemporary idiom, in this case that of the wolf in sheep's clothing. Though the commonest retelling of the story in English follows the version by Abstemius, it is often credited to Aesop. Another variant fable by Aesop is number 234 in the Perry Index. This concerns a wolf that regularly comes to view the flock but never attempts any harm. Eventually the shepherd comes to trust it and on one occasion leaves the wolf on guard. He returns to find his flock decimated and blames himself for being taken in. In neither case is there the suggestion by Aesop that the wolf disguised itself as a sheep. Yet another variation on the disguise theme was included in the Cento favole morali ("100 moral fables", 1570) of the Italian poet Giovanni Maria Verdizotti. In this the wolf dresses itself as a shepherd, but when it tries to imitate his call it wakes the real shepherd and his dogs. Since the wolf is encumbered by its disguise, it cannot get away and is killed. This is the version followed in La Fontaine's Fables (III.3). The conclusion both poets draw is the same as that of Nikephoros. The story entered the English canon under the title "The wolf turned shepherd" in Roger L'Estrange's 1692 fable collection and in verse as "The Wolf in Disguise" in Robert Dodsley's Select fables of Esop and other fabulists (1765). Earlier illustrations of the fable concentrated on the hanging of the wolf. More recently the emphasis has been on the disguise. In France the theme of the wolf disguised as a shepherd is more common. A number of recent CDs are titled A Wolf in Sheep's Clothing, although most are references to the idiom and the fable is not mentioned in the words of any of the songs. The same is true of many songs that have the phrase as their title. One exception is the lyric by Tackhead on their 1991 CD Strange Things, which uses the fable for a satirical attack on Capitalist entrepreneurs. Zoologists have repeatedly compared predatory animals which make use of aggressive mimicry to a wolf in sheep's clothing, including jumping spiders, lacewings, ant-mimicking aphids, hemipteran bugs mimicking chrysomelid beetles, bird-dropping spiders, orchid mantises, cichlid fish, and the zone-tailed hawk which flies with vultures; these animals have evolved to deceive their prey by appearing as other prey, or like angler fish and snapping turtles lure the prey by appearing as the prey's prey. ^ Greek: Προσέχετε ἀπὸ τῶν ψευδοπροφητῶν, οἵτινες ἔρχονται πρὸς ὑμᾶς ἐν ἐνδύμασιν προϐάτων, ἔσωθεν δὲ εἰσὶν λύκοι ἅρπαγες. ; Latin: Adtendite a falsis prophetis qui veniunt ad vos in vestimentis ovium intrinsecus autem sunt lupi rapaces. ^ Heneberg, Petr; Perger, Robert; Rubio, Gonzalo D. (2018). "A wolf in sheep's clothing: The description of a fly resembling jumping spider of the genus Scoturius Simon, 1901 (Araneae: Salticidae: Huriini)". PLOS ONE. 13 (1): e0190582. doi:10.1371/journal.pone.0190582. ^ Eisner, T.; Hicks, K.; Eisner, M.; Robson, D. S. (1978). ""Wolf-in-Sheep's-Clothing" Strategy of a Predaceous Insect Larva". Science. 199 (4330): 790–794. doi:10.1126/science.199.4330.790. ^ Salazar, Adrián; Fürstenau, Benjamin; Quero, Carmen; Pérez-Hidalgo, Nicolás; Carazo, Pau; Font, Enrique; Martínez-Torres, David (2015). "Aggressive mimicry coexists with mutualism in an aphid". Proceedings of the National Academy of Sciences. 112 (4): 1101–1106. doi:10.1073/pnas.1414061112. PMC 4313836. The dual strategy developed by the aphid P. cimiciformis outlines a complex evolutionary scenario. On the one hand, the round morph and the ants, engaged in a trophobiotic relationship, should be subjected to the conflicts of interest typical of mutualism, with selection driving each partner to maximize its benefit by giving the least of its own energy and resources. On the other hand, the flat morph and the ants can be expected to be engaged in an arms race, with selection favoring improved deceiving abilities in the aphid and increasingly finer discrimination abilities to detect noncolony members in the ants. ... We believe that, beyond providing an unusual case of a 'wolf in sheep’s clothing,' this system opens up a host of interesting and potentially novel questions about the evolution of cooperation and exploitation. Book illustrations of "The wolf in sheep's clothing"
Book illustrations of "The wolf as shepherd"
This page was last edited on 15 April 2019, at 17:57 (UTC).